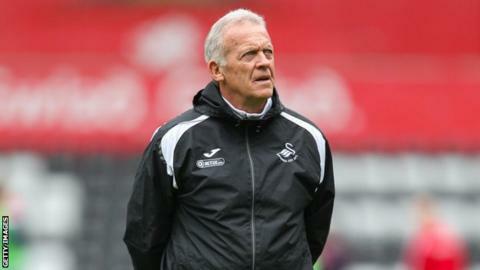 Alan Curtis is retiring from coaching at Swansea City but will take up a new role as honorary club president. Club legend Curtis, who turned 65 on Tuesday, has been an assistant coach under Graham Potter since last summer. Curtis, one of the greatest players in Swansea's history, has filled numerous off-field roles at the club. "After over 40 years serving the club, I felt this was the right time to step back from day-to-day involvement," Curtis told the club website. "After considering this for some time, the end of the season was the correct time for me to finish my coaching career." Born in Rhondda, Curtis was spotted by Swansea as a teenager and went on to play more than 400 games across three spells at Vetch Field. He played in all four divisions for Swansea, scoring 110 goals. Alan Curtis has been caretaker manager at Swansea on three occasions. The 35-cap Wales forward also played for Leeds United, Southampton, Stoke City and Cardiff City before finishing his professional career with the Swans. He went on to work as Swansea's community office before serving as youth coach, head of youth development, first-team coach, assistant manager, loan player manager and, on three occasions, caretaker boss. He joined Potter's coaching team in June 2018, and has played a part in shaping an exciting young Swansea team following the club's relegation from the Premier League. He will remain on Potter's staff until the end of the season. "I am now looking forward to seeing how this young team progresses under Graham while serving my new role as honorary club president," Curtis added. Alan Curtis, one of Swansea City's finest, tells an amusing tale about the time he played against the club for Cardiff City. "I was booed by both sets of fans," he says with a smile. It is safe to say that any Swansea supporters who were unhappy with the sight of Curtis in Cardiff blue are over it now. Curtis had quickly established himself as a darling of Vetch Field after joining Swansea as a teenager. The best part of half a century later, he remains a firm favourite among the club's fans. Curtis was born and raised in Rhondda, but is regarded as one of Swansea's own having given more than 40 years' service to the club. He wore the white shirt in all four divisions, scoring 110 goals across three stints at the Vetch. No strike was more memorable than Curtis' effort against Leeds United on the opening day of the 1980-81 season, Swansea's first as a top-flight club. Curtis, who had recently rejoined Swansea after a disappointing spell at Leeds, shimmied one way and then the other before rifling the ball into the net. Had the gates to the Vetch been open, Curtis said afterwards, he would have run all the way to Mumbles in celebration. It is the moment which springs to mind whenever Curtis' name is mentioned, yet he has brought so much more to Swansea City. His coaching days may be over, but it is only right that Curtis will stay on at Swansea as life president. The place would not be the same without him, after all.